Workman Publishing Company, 9780761176466, 224pp. How many great ideas begin with a nagging thought in the middle of the night that should disappear by morning, but doesn’t? 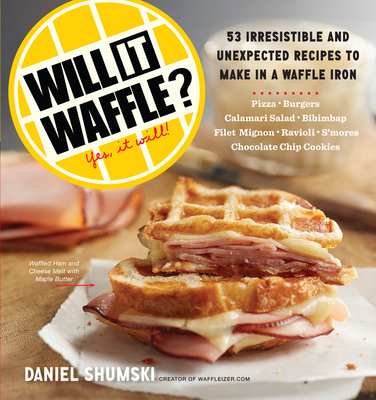 For Daniel Shumski, it was: Will it waffle? Hundreds of hours, countless messes, and 53 perfected recipes later, that answer is a resounding: Yes, it will! Steak? Yes! Pizza? Yes! Apple pie? Emphatically yes. And that’s the beauty of being a waffle iron chef—waffling food other than waffles is not just a novelty but an innovation that leads to a great end product, all while giving the cook the bonus pleasure of doing something cool, fun, and vaguely nerdy (or giving a reluctant eater—your child, say—a great reason to dig in). Waffled bacon reaches perfect crispness without burned edges, cooks super fast in the two-sided heat source, and leaves behind just the right amount of fat to waffle some eggs. Waffled Sweet Potato Gnocchi, Pressed Potato and Cheese Pierogi, and Waffled Meatballs all end up with dimples just right for trapping their delicious sauces. A waffle iron turns leftover mac ’n’ cheese into Revitalized Macaroni and Cheese, which is like a decadent version of a grilled cheese sandwich with its golden, buttery, slightly crisp exterior and soft, melty, cheesy interior. Daniel Shumski is a writer and editor who has hunted ramen in Tokyo for the Washington Post and tracked down ice cream in Buenos Aires for the Los Angeles Times. Between stints at the Chicago Sun-Times and the Chicago Tribune, he worked for a Midwestern heirloom apple orchard. His first book, Will It Waffle? : 53 Irresistible and Unexpected Recipes to Make in a Waffle Iron, won praise from the New York Times, People magazine, and Food52. He lives in Montreal, where his French is still a work in progress. "Will It Waffle? Why didn't you tell me about this . . . sooner?"